I accept the offer almost before it lands in my inbox: I’m going to be a judge in Mission Pie’s 12th Annual Community Pie Baking contest! Immediately I imagine the Great British Bake Off, its big white tent in Berkshire teleported to Mission Street, and I’m Mary Berry — a stern but compassionate judge, an infallible baker with an upper-crust English accent. Pies will be “scrumptious,” bakes “lovely,” “soggy bottoms” tragic. Gobsmacked, I drop the fantasy and remember that I’m only a casual baker. Instead of feigning expertise and a half-baked accent, I should be in training. But what kind? Should I start running to slim down for the onslaught of carbs and sugar? Or should I be carb-loading to build up my tolerance? By Sunday, September 9, I have neither run daily nor eaten an inordinate amount of pastry. I have a sandwich for lunch and head up to Mission Pie where I discover my fellow judges have eaten nothing. Have I overdone it? The other judges seem to know a lot more about pies. They include Ali Dalsing, a baker at Mission Pie; Blair Cardigan, a baker at Jane the Bakery; Andrew Kearns from Veritable Vegetable, the winner of last year’s contest; Rita Stainton; and Javi Ramirez, a sophomore at Lowell High School. Is that a British accent I detect in Javi? Mmm, he even seems to look a bit like a young Paul Hollywood, Berry’s counterpart on the Great British Bake Off. There’s no time to investigate. Krystin Rubin, executive chef and co-owner of Mission Pie, distributes the clipboards, tallying sheets and lots of tasting forks. 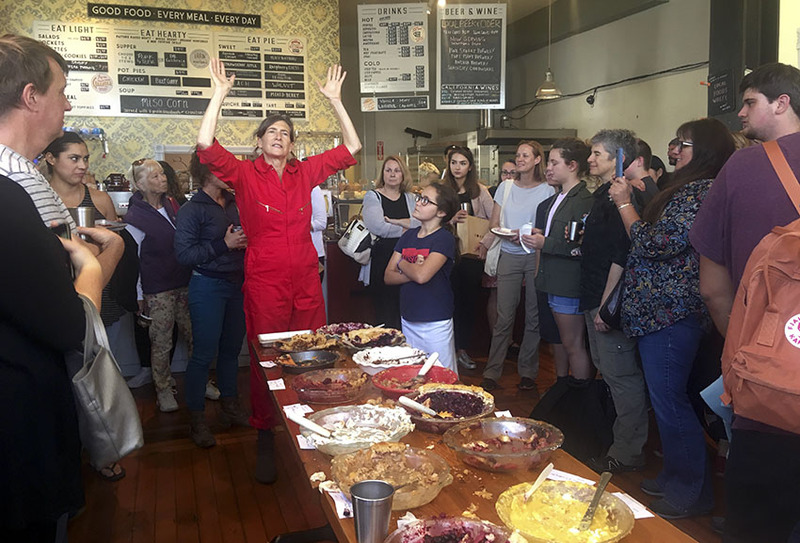 Karen Heisler, the other owner, dashes around in a red jumpsuit and, along with Hazel, a young assistant, begins to deliver pies to our tasting table. At 1:30 p.m. we begin cutting into the 19 entries — multiples of blueberry pies, peach with brown sugar, apple, pear, passion fruit, chocolate turtle, sunchoke (that’s Jerusalem artichoke) and cheese, passionfruit meringue, banana cream, peaches and cream, grape and bittersweet chocolate. Blair and Ali use a vocabulary that speaks to expertise. A slice stands well, or runs, or is too complex. We discuss whether a pie needs to look as good as it tastes. “This sounds like a philosophy group,” says Heisler, bringing in another pie. As it turns out, it is quite easy to eat 19 bites. I go back for seconds. Once we’ve selected the winners, we enter the main dining room, where all the pies have been laid out on a long table. The room is packed with pie eaters tasting and voting on the People’s Choice Award. Ally DeArman, pie fan, in the foreground during the tasting for the People’s Choice Award. Photo by Lydia Chávez. I talk to Ally DeArman who, I discover, is the director of the non-profit Food Craft Institute. She says she used to live around the corner from Mission Pie and returns from Oakland every year for the event. Her plate is piled with an assortment of the entries. Based on the “perfect” crust alone — the crowd has demolished the rest of the pie — she bets that the sunchoke and cheese is the winner. She might be right. I don’t usually like Jerusalem artichokes or cheese in pastries, and yet the combination is scrummy. DeArman has entered the contest twice. Her critique of those failed attempts: she tried to be too fancy. Ah, I think: the problem with so many of the contestants on the Great British Bake Off. 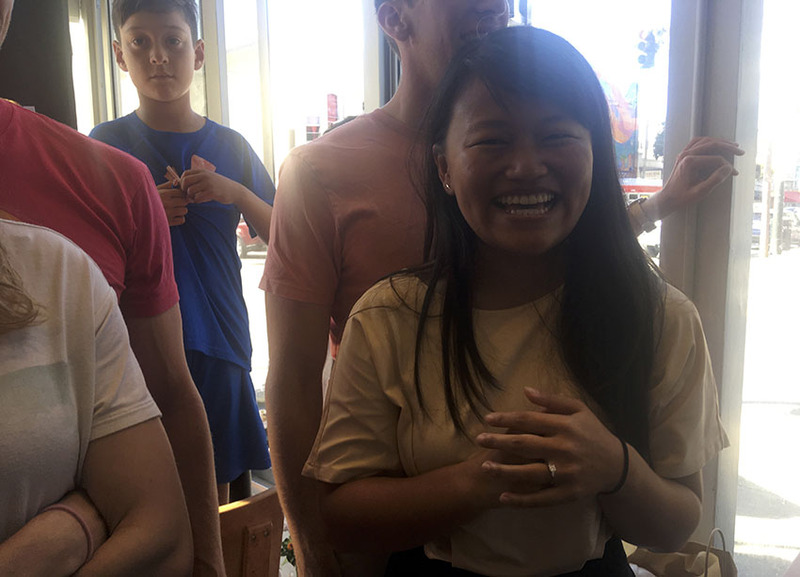 Before I can share this thought, however, Heisler arrives, throws up her arms to command attention, and says it is time to announce the winners. Rubin climbs atop a chair and builds suspense without torturing the contestants. Jess Chen’s Plum Berry Pie wins for best berry pie, and Chen is ecstatic. Her boyfriend takes her in his arms and his I-knew-you-would-win expression says it all. Food is the way to that man’s heart. Jess Chen, one of the winners. 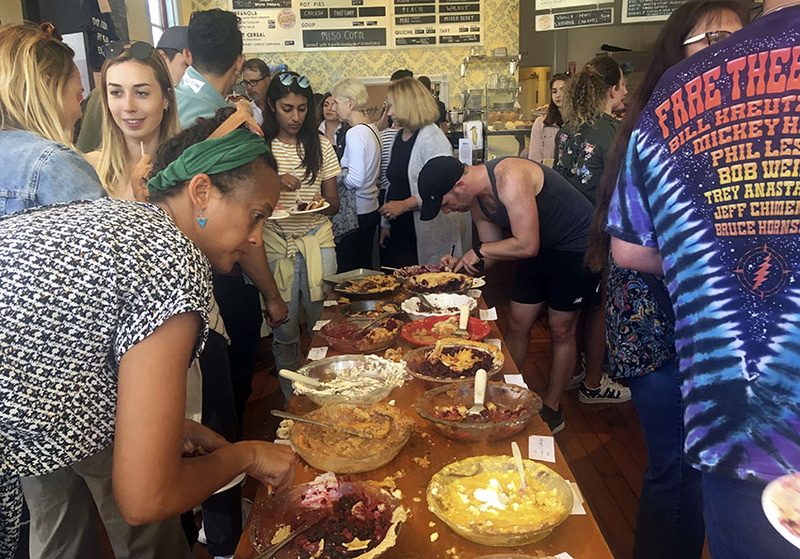 Cheers go up as each winner is announced: Pamela Cowan’s brown butter maple peach wins for the pie we wanted seconds of, and Sophie Manadori’s banana cream pie is the pie that started a fist fight among judges (I was only slightly bruised. And, OMG, Manadori is only 15 — one of three youths who entered, Heisler later reminds me). The People’s Choice award goes to Mandy Adkins’ apple pie. Then, the drum roll for best in show — the top prize, the winner of the velvet crown, the baker who wins the day. It is Juliet Bonczkowski for the sunchoke pear cheese pie. I look at DeArman in awe. She had it. One bite of that crust and she knew. Inspired, I walk home to plot my next pie.